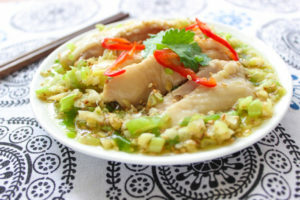 Turn to medium heat, carefully add in the chicken leg, ginger slices, green onion and stat anise into the boiling water and cook for about 7-8 minutes with lid on until the chicken is cooked through. Fish the chicken out, discard the boiled water, place the chicken under water with ice in it for about 5 minutes. Remove the chicken from the cold water, drain well, and cut the chicken into long pieces and place them onto a plate, set aside. Put green onion, garlic, ginger, sesame seeds in a container, toss in the salt and soy sauce. Heat the oil in a pan until smoking, carefully pour the hot oil around into the container, wait until the sizzling stops, mix all the ingredients well. Wait a couple of minutes for the sauce to cool off, pour it onto the chicken. Top with cilantro and red chili pepper to serve.